Streets on Carson served our group some of the most unique chicken wings I've had in recent memory. In general, chicken wings are served fried, baked or smoked. (I would even venture to say in that order of prevalence.) Streets on Carson has a unique style, they serve a confit chicken wing that has a remarkable texture and a very original flavor. 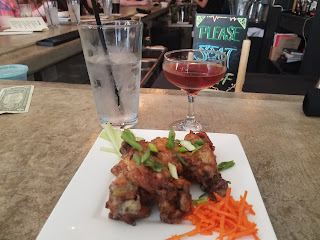 They only serve one style of wings and they come with roasted garlic, roasted jalapeno puree, fresh lemon juice, scallions, celery and carrot. I found the citrus and garlic to be the most prevalent flavors, I could not taste the jalapeno. In all my chicken wing adventures throughout the lands, I do not believe I've had a wing that featured a citrus profile. It was great! The wings were exploding with flavor, and although the meat was falling off the bone, the skin still maintained a crispiness due to the confit cooking style. I cannot remember what this thing was called, I believe it should be called the peasant's egg roll. 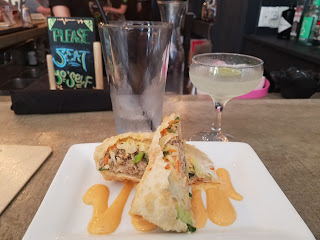 ( I'm just kidding, it was a pretty standard pork egg roll with cabbage, carrot, scallions, cilantro and sirracha aioli.) Although I called this egg roll standard, you can tell from the photo that great care is taken in the preparation of all of the dishes at Streets on Carson. Other favorites included the duck fat poutine and the jerked chicken skewers. Hit up happy hour from 5 - 7 for discounted small plates and drinks.